MANILA, Philippines — The presence of Chinese vessels in the vicinity of Philippines-controlled islands in the West Philippine Sea would likely become the norm in the disputed waters. Hundreds of Chinese ships, likely part of the country’s maritime militia, have recently been spotted loitering near Pag-asa (Thitu), Kota (Loaita Island) and Panata (Loaita Cay) Islands. “As prior research has shown, the maritime militia is and will likely remain the most visible arm of China’s power directed at its neighbors in the Spratly Islands,” AMTI said in its report published Tuesday. Satellite photos obtained by the think tank from March and April confirmed the presence of Chinese Vessels near Kota Island, which is 24 nautical miles south of Pag-asa Island and Chinese-controlled Subi Reef. “In almost every instance, the vessels are riding at anchor, many in large clusters, and without fishing gear in the water,” the report read. Satellite images dated March 12 showed a Chinese fishing trawler about 50 meters from Kota Island. This would increase to eight large trawlers on March 16. By March 29, at least 15 large Chinese vessels and eight small boats were seen in the area of Kota Island, where the Philippines hosts a small military garrison. The report also indicated that 13 of the 15 Chinese vessels measured about 50 meters while the remaining two were estimated to measure 20 meters. “Some were located between 2 and 2.5 nautical miles from Loaita Island, and one loitered near unoccupied Lankiam Cay to the east, but most were arrayed around Loaita Cay. None were engaged in trawling or appeared to have fishing gear deployed,” AMTI said. The AMTI also observed that Chinese militia vessels operate considerably closer to the Philippine outpost at Panata Island. Four Chinese trawlers were spotted less than half a nautical mile from Panata Island, which the think tank noted was closer than it has ever seen any militia ships approach another country’s facility before. “This must be particularly provocative for the Philippine detachment on the cay, who likely rely on frequent resupply and relief from those on Loaita Island,” it said. The bigger ships are the same as the ones seen extracting giant clams from Scarborough Shoal but no scarring has been seen on the reefs near Kota and Panata Islands yet. “No new scarring is visible on the reefs, either on March 29 or in subsequent imagery, so these boats could have been engaged in other types of reef fishing. Or, like the larger Chinese vessels, they have been foregoing fishing in the service of the maritime militia,” AMTI said. 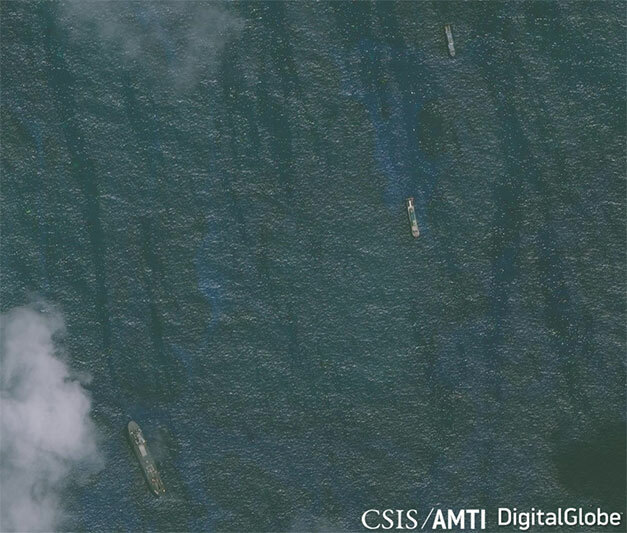 A more recent image dated April 7 showed only six large vessels and two small boats near the features in the Manila-controlled features in the Spratly chain. The Philippine government earlier declared that it would protest the reported presence of Chinese militia ships in the area of Kota and Panata Islands if validated. Presidential spokesperson Salvador Panelo said he was sure that Foreign Affairs Secretary Teodoro Locsin Jr. would file a new protest over the continued presence of Chinese vessels on Philippine waters. “They cannot be intruding in our territorial property,” Panelo said last week.